It's hard to hear yourself think in today's culture, much less refresh your soul. Sights and sounds—from ads placed on toilet stall doors to loud ringtones or cars pulsing with bass—assault us every day. Peace and quiet seem out of place in 21st-century everyday life. It's time to mute the cacophony. Meaningful and serene contemplative silence is possible. And it doesn't require an expensive trip to a spa. "We yearn for rest, and our souls hunger to be fed, yet we seldom give ourselves permission to respond to these yearnings," the authors write. "The quiet spaces described in these pages are places intentionally designed to invite sabbath rest and to encourage reflection on, and quiet awareness of, the Spirit of God." Jane Young and Gerrie Grimsley met when they agreed to help create meditative spaces for a summer retreat called SOULfeast. Their innovative and yet practical efforts were so well received that they now teach others how to arrange settings and objects (such as a photograph, a leaf, a pencil) to encourage spiritual reflection and, most importantly, achieve stillness. 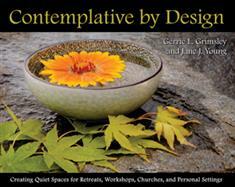 Learn from their experience and inspiration to create your own simple prayerful oasis in your church or home that encourages new ways of communing with God. Their guidance offers a gentle path to awareness of the everyday sacred. Receive the refreshment of God's hospitality through your own experiential prayers and quiet spaces. This book will help you know the meaning of Psalm 46:10: "Be still, and know that I am God."